If you’re reading this series you know Hal Jordan (if not, go ahead and click the link above and if you’re wondering what happened before this series click here). Hal spends the bulk of this issue poorly disguised as “The Man With No Name.” This is a nice nod to Sergio Leone’s classic spaghetti western “Dollars Trilogy” (A Fistful of Dollars, A Few Dollars More, and The Good, The Bad and The Ugly). In the trilogy, Clint Eastwood portrays The Man With No Name. Jordan’s version has four arms and no poncho. In the aughts, Dynamite Comics picked up the license for Eastwood’s iteration of the character and published a couple dozen issues. The first Green Lanterns we see teaming up with Hal Jordan to battle the Sun-Eaters are Space Sector 2812’s Venizz and Tagort. They also appeared in issue three, so I covered the duo’s history here. When the Green Lanterns seek out Crassius Qwipe-6 Lashorr is part of the team rounding up the beasties. We also saw her in the previous issue. Everything we know about her is here. Hooray, everyone’s favorite volcano headed Green Lantern has returned! We last saw Volk in The Green Lantern #2. This time he’s under orders to bring Jordan back to see the Guardians of the Universe so he can answer for the apparent murder of Volgar Zo. We covered Volk’s history two deep dives ago. The plant-based Medphyll makes an appearance cleaning up all of the beasts. His history was explained in the issue three deep dive. This is the first appearance of Hyperia-3. It appears to be some sort of intelligent computer star. Jordan’s ring describes Hyperia-3 as “a stellar A.I. or ‘smart star. 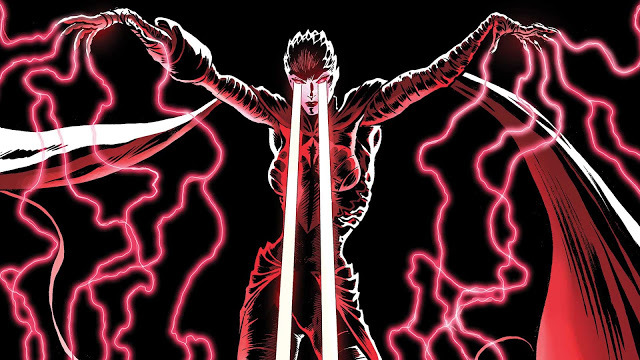 '” Deep Space Transmission suggests there’s a resemblance to Solaris the Tyrant Sun from DC One Million #1 by Morrison and Val Semeiks. Honestly, that’s a new one to me, so I have some reading to do. Check out Comics Alliance’s (tragically, RIP) article if you want some cliff notes on the villain. If this Lantern is indeed star size that would make it larger than the current biggest Green Lantern, the living planet Mogo. That doesn’t make it the biggest a Lantern has ever become. Green Lantern Flodo Span once expanded to become as large as an entire space sector. Ash-Pak-Glif appears toward the end of the book as Jordan’s being carted off to his birthplanet or “another planet of your choosing, pending investigation and a full psychiatric evaluation. This is basically the Guardians saying “hey, you’re under house arrest, but you can choose any house on the block.” This is why I think the Smurfs are in on Jordan’s flip to the Blackstars. I digress. You’ll note in the captions above that three of the Green Lanterns above are unknowns. This issue mentions Green Lanterns John Stewart, Simon Baz, and Jessica Cruz. After seeing Stewart in a panel with the JLA last issue, this is the first time Morrison has mentioned Baz and Cruz. One of the Guardians of the Universe says “Lanterns Stewart, Baz and Cruz will take care of matters on Earth.” This statement creates a minor Greater DC Universe canonical tremor as Cruz is currently in the Ghost Sector and nowhere near Earth. The Guardians should know that. Anywho, if you’re curious about the whereabouts of all of Earth’s Green Lanterns I make monthly updates to this “Green Lanterns: Where Are They Now?” post. If you’ve been following this comic, and if you’re reading my round-ups I’m guessing you are, you’ve been hungrily waiting for more background on the iconic vampiress, Countess Belzebeth. We finally get our first real look at what she’s all about in issue four. Starbreakers first appearance in Justice League of America #96. Sharp paid tribute with this cover of The Green Lantern #4. “Luciphage” is the Thangarian word for ‘light-eater’ and it’s how the Thangarian Death Cult refers to Starbreaker. Although he’s often referred to as an energy vampire that really understates how powerful Starbreaker actually is. There’s a good reason the Death Cult, and countless other civilizations, fear Starbreaker as a God. Basically, as we see in this issue with his offspring, he feeds on the energy of planets and stars. Specifically, his favorite form of dinner preparation is when a planet is being consumed by a star. Starbreaker fires back (literally) “a sun eater is but the larval form of my species. You tremble at the thought of the infant, and yet dare challenge the adult?” At the time, it was a wild gauntlet for McDuffie to throw and no one really ran with that idea until now. And boy does Morrison run with it. Holy crap. 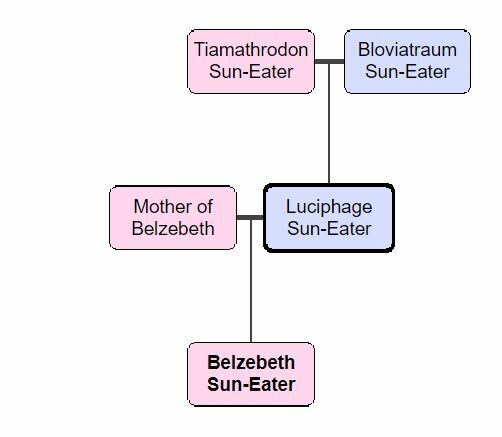 Now Sun-Eaters have proper families. When Jordan, undercover as the “Man With No Name,” tells Belzebeth one of the Sun-Eaters was slain in battle she whispers under her breath “Grandfather Bloviatraum dead?” So…was that Starbreaker’s Dad? And was the one captured by Green Lantern Hyperia-3 his Mom? I made a family tree. We were first introduced to the Anti-Matter Lantern in The Green Lantern #1. We didn’t know much at the time but I did an unhealthy amount of speculation. This issue tells the story of how Controller Mu and the Blackstars acquired the Anti-Matter Lantern. Questions that remain unanswered include where the Anti-Matter Lantern came from and why the ant-sisters have him sealed in a vault. Those are two big questions. The Sun-Eaters we know today technically weren’t the first Sun-Eaters. In a Legion of Super-Heroes story from Adventure Comics #305 Mon-El had to battle a humanoid looking creature simply known as “Sun-Eater.”He wasn’t the amorphous cloud we know today. This Jerry Siegel and John Forte concept of a Sun-Eater was a creature that would literally fly into a star and eat it bit-by-bit like a hamburger. Unlike the Sun-Eaters that would come later, this one was easily defeated when Mon-El used his heat vision to give it a hot foot. That is not a joke. Comics, amiright? If you want to understand why Mon-El is dressed like a 1940s school boy you’ll need to read the issue. 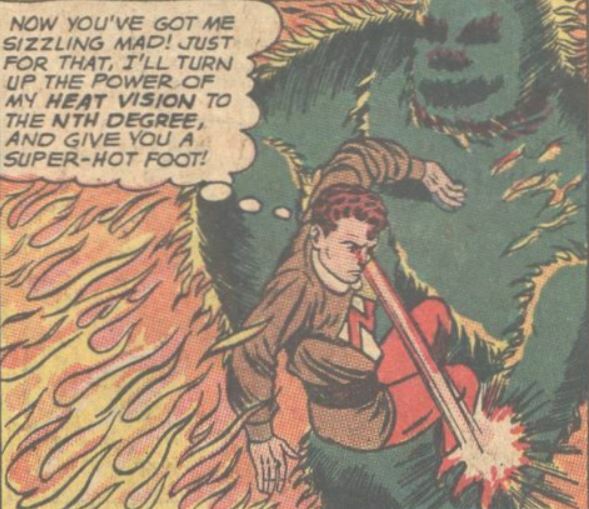 A more threatening form of the Sun-Eaters would arrive five years later in Adventure Comics #352. 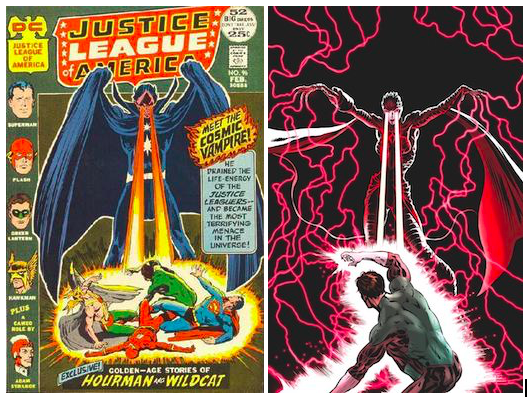 The events of Final Night, which acted as a sort of redemption for Hal Jordan, were triggered by a Sun-Eater consuming the Earth’s Sun. The Sun was reignited when Jordan, as Parallax, blew himself up to defeat the Sun-Eater and reignite the Sun. Here’s another ripple in the DC Universe. Morrison and Sharp have reverted the Guardians back to the way they were portrayed back in the day. They’ve erased the individualism that developed over the years thanks, mostly, to the addition of humans to the ranks. Jordan and his crew influenced the blue dudes and very specifically, Ganthet. My assumption going into issue one was the Guardians, having screwed up over and over again, had decided to pull back and start again on New Oa. That brings us to this month’s Justice League Annual #1. Not sure what’s happening here. Perhaps the Guardians appear one way on New Oa and another way when out and about helping to save the galaxy. Maybe these seven Guardians on Oa (why there are seven is a whole other question because the fact that only five were left living at the end of Hal Jordan and the Green Lantern Corps was a major subplot) serve a different purpose than Guardians like Ganthet and his previously pregnant partner Sayd? I don’t need these continuity questions answered to enjoy comics. Personally, I often wish Marvel and DC would allow series to do their own thing without forcing it to be overly connected to every single other title on the shelves. One of the reasons I love this title, aside from my “Morrison is the better chaos wizard” bias, is because it feels like an isolated story freed from the restraints of heroes being in crisis and laughing Batmans and clocks of doom. I’m not worried the storyline will come to a halt so we can shoehorn in an obligatory companywide crossover. That said, my desires aren’t the reality of modern comics. Clear continuity, to the detriment of the industry (again, my opinion), is the expectation. Therefore, if this series is taking place in the same continuity as the rest of the DC Universe, the DC editorial board needs to have a chat about character design. IMO, as the only Green Lantern title on the shelves, it should be the leader when it comes to the current appearance of characters in other titles. I demand a flashback where we see Ganthet get his head shaved. Maybe he loses a bet to Guy Gardner, so now he wears a George Carlin wig when he leaves New Oa because he misses his ponytail. I’ll be honest, I’m still not 100 percent certain Crassius Qwipe-6 is this character’s name. At first, I thought Hal was asking if Belzebeth had heard of a place called Crassius Qwipe-6. This is likely the lion looking fellow’s first appearance in a comic. He’s possibly a random alien who looks like a lion or he could be from the planet Karna. Karna is the home planet of the legendary Tigorr of the Omega Men. Karnans are basically a species of humanoid big cats. 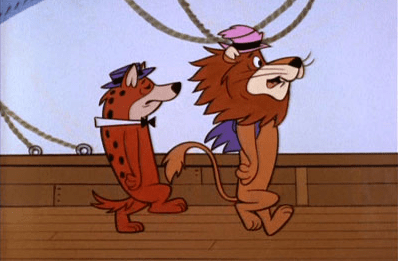 Unlikely theory: This is Lippy the Lion making his first cross-Universe appearance as part of DC’s Hanna-Barbera Beyond initiative. I always thought Space Ghost would make more sense for a Green Lantern crossover. According to Deep Space Transmissions (I really need to read more Golden Age Adam Strange comics, too), these beings first appeared in the Julie Schwartz (co-creator of Adam Strange and Rann) tribute DC Presents: Mystery In Space #1. Possibly a new creation from Sharp and Morrison. Sharp loves putting Easter Eggs in his work and I’m pretty sure these cute little guys are relatives of Brainiac’s pet Koko the Space Monkey. The primary difference is these creatures are pink while Brainiac’s pet was white. The sole purpose of Koko was to give Brainiac someone to talk to while in space. Space is lonely. It was also a clever way for the story writers to telegraph exposition without using thought bubbles. 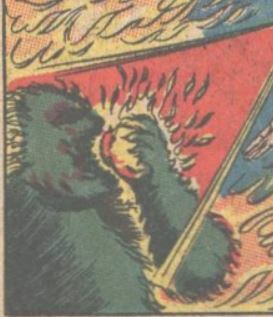 Koko was essentially erased from existence after Crisis on Infinite Earths decided supervillains can’t have pets. No wonder Brainiac’s become eviler over the decades. Another fun fact if you visit that tweet? In the black and white draft of page 4, the doors to the vault have the original Darkstars insignia. In the final colored comic version that insignia is gone. Were the original Darkstars responsible for imprisoning the Anti-Matter Lantern? Okay, so Rann. I guess I’ll start at the beginning. Rann is one of the most important planets in the DC Universe. It’s the adopted home planet of Adam Strange. I’m not going to spend time on Adam because he doesn’t appear in this issue and it looks like he’ll be an important player in the sixth issue. Oh, wait, one thing about Adam Strange: He’s in the better-than-it-should-be SyFy show Krypton. Go watch it before Lobo shows up in season two. During the Golden Age, Adam Strange and Rann were basically a riff on Edgar Rice Burroughs’ John Carter of Mars and Robert E. Howard’s Almuric. Due to being in the Golden Age, there isn’t a whole lot of canon when it comes to Rann. The common factor is Strange gets sucked back to Rann thanks to the Zeta-Beam and something happens with his Rannian love Alanna. That said, thanks to the lack of canon the planet of Rann is freakin’ bonkers when it comes to wildlife and monsters. Fast forward to 2005, Rann is teleported into the Polaris system by a group of militant Thanagarians. Rann arriving in Thanagar’s orbit is believed to cause devastation on the surface of Hawkman’s home planet (Spoiler: it was actually Superboy-Prime). Although Rannians attempted to save the Thanagarians by allowing them to settle on Rann, a civil war was instigated by…wait for it…the Thanagarian Death Cult worshippers of Luciphage the Starbreaker. Eventually, things get sorted, mostly, and the Green Lantern Corps terraform Thanagar’s surface to make it once again habitable. The peace didn’t last long. Soon Rann found itself in battle with Lady Styx and Synnar. In a drastic and costly moment, Strange decides the only option is to detonate Rann’s atmosphere, thereby destroying the plant. Many of the Rannians escape to Throneworld which is dubbed “New Rann” while others are forced to live aboard starships. The always helpful Vril Dox comes up with a ridiculous solution as he tries to establish a base for L.E.G.I.O.N. in the Vega System. He transports the entire planet of Rann to the Vega system on an orbit previously occupied by the planet Tamaran (Starfire’s home planet). He starts terraforming the planet and as the Rannians move in a rebel force of Tamarans led by Starfire’s sister Blackfire, decide the planet should belong to the Tamarans. Vril Dox is able to broker peace (to the chagrin of the Guardians of the Galaxy who see it as an affront on the power of the Green Lantern Corps). I believe the current status of Rann is a shared planet with the Tamarans living on the Southern continent. I haven’t checked in on Rann since R.E.B.E.L.S. and that’s where most of the wiki entries leave off. If there’s been a change please let me know. This is the first, and considering what happened in the issue is likely the last, appearance of the planet Weirwimm. The planet was populated by ant-like beings. The planet is believed to have perished after Countess Belzebeth brought a Sun-Eater to devour the system’s M-Sequence star. She did so after blackmailing the “ant-sisters” into opening a vault containing the Anti-Matter Lantern. There are a number of people doing solid work around these issues. Therefore, I’m adding this section to acknowledge reviews and annotations providing deeper insight into what’s going on with this series.